I am not selling silkies at this time, but will be in the future. I feed my silkies a varied diet. I start my chicks on chick starter crumbles and hardboiled eggs (whites & yolk) . Once theyre a few weeks old I start giving them treats , such as mashed baby peas & yogurts with fruit. When they hit adolescence , I mix some grower finisher pellets in with their crumbles , and then some laying pellets. For treats I give them all sorts of things, such as romaine lettuce, peas, whole wheat or multigrain breads . In the winter its hard to find a large assortment of fruits , once spring arrives I start feeding them apples, oranges, watermelon, strawberries , peaches & a few other fruits. As adults I feed laying pellets one week, grower finisher the next. I also give them all the fruits & breads that they want. Cracked corn or hen scratch is not a main part of any of my birds diet . In the spring & summer they are fed very little scratch, and its only fed as a treat. In the winter I increase the scratch to a couple of handfuls daily for each pen. Many broody hens wont get off the nest to eat or drink , for this i make sure each sitting hen has food & water right next to her nest so that she doesnt even have to stand to reach them. I am sure to give them xtra treats so that while they are sitting they do not get too thin. 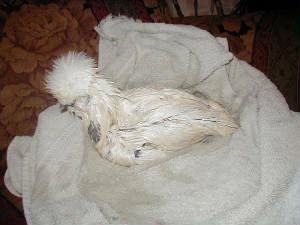 Silkies quality can vary from pet quality to the best breeder quality. When inquiring about my birds, please let me know exactly what you are looking for. I do not show my silkies at this time, my main reason is biosecurity. All my birds are mailed with a good supply of oranges & feed. I found that oranges are the best fruit for shipping becuase it doesnt dry out fast & the birds are already used to eating & love them. Usually by the time they arrive theres nothing left but the peels. In the hot summer weather its important that shipped birds have a source of hydration . Over the past few years people have really taken an interest to new & exciting silie colors. Its nice to see something new & different. I am all for new colors, its time the APA silkie standard has some updating. Over the past few years we have seen silkies crest size double, and the foot feathering is just amazing these days. Theyre a far cry from the first silkies I saw on my aunts farm back in the early 80's. Silkies have become more beautiful & no-one can resist a silkie with a softball sized crest. Combs have also gotton smaller also, silkie lovers seem to love the look of a tiny comb on roosters..myself included. Even the silkies bodies have changed, they seem to be wider & rounder than ever.